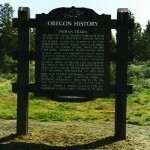 An ancient trail passed through here as part of an extensive Indian trade network linking peoples of the Northern Great Basin and Columbia Plateau to those living west of the Cascades. Obsidian, bear grass, and slaves were transported over these trails to major trading locations along the Columbia River in exchange for dried salmon, smelt, sturgeon and decorative sea shells. The long established route was later used by Peter Skene Ogden’s fur trapping expeditions in 1825 and 1826. Fur trader Nathaniel Wyeth was here in the 1830s. Captain John C. Fremont followed this route on his 1843 explorations for the United States and Lt. Henry L. Abbot headed a Pacific Railroad survey party along it in 1855.